10 and 225 North Main Street, Bristol - NEW EXPANDED SERVICES! APRNs and Physicians Can Earn Up To A $10,000 Sign-On Bonus At Wheeler! Pediatrician Nike Kubeyinje, M.D., FAAP has joined the Wheeler Family Health & Wellness Center at 43 Woodland Street, Hartford. In this role, Dr. Kubeyinje provides general medical care for consumers, including infants, children and teenagers and continuity of care for college aged patients and young adults. “I am pleased to join the Wheeler team, and I look forward to treating the whole-health needs of children, adolescents and young adults,” said Dr. Kubeyinje. On-site pediatric services at 43 Woodland Street include well-child care and immunizations, sick child visits, physical exams, and more. Wheeler also provides on-site full family dental care and referrals to specialty services for children and adolescents, as well as behavioral health services and a full continuum of care. Prior to Wheeler, Dr. Kubeyinje held pediatric positions with Children’s National Medical Center in Washington, D.C., Community Health Centers, Inc. of Orlando, Florida, and within private pediatric practices. She also served as an assistant clinical professor at George Washington University College of Medicine and Health Sciences/Children’s National Medical Center. 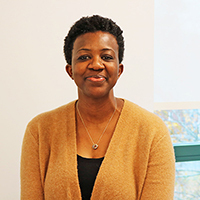 Dr. Kubeyinje obtained her BA in Biology from Western Connecticut State University and her Doctor of Medicine degree from Howard University School of Medicine. Expanded primary care and behavioral health services are now available for residents of Bristol and surrounding towns through Wheeler’s Family Health & Wellness Center at 10 North Main Street and 225 North Main Street. Teodoro Anderson Diaz, LCSW, LADC, a behavioral health care leader and practitioner, has joined Wheeler as vice president of Adult Outpatient Services. Wheeler’s Care Coordination teams in New Britain and Hartford were awarded a one-year grant from the Substance Abuse and Mental Health Services Administration to assist and treat families who fled to Connecticut from Puerto Rico after the devastation of Hurricane Maria. Wheeler is a statewide, non-profit, community-based organization that provides comprehensive solutions that address complex health issues, providing individuals, families and communities with accessible, innovative care that encourages recovery, health and growth at all stages of life. Wheeler provides behavioral health, addiction and primary care services across Connecticut, including treatment for mental illnesses such as depression and anxiety, opiate and heroin addiction, substance abuse, alcoholism, asthma, high blood pressure, diabetes, and much more. Wheeler is accredited for Ambulatory Care and Behavioral Health Care, and certified for Primary Care Medical Home and Behavioral Health Home, by The Joint Commission. No patient will be denied health care services due to an individual’s inability to pay for services. In accordance with Wheeler policy, a sliding fee scale system is in place to adjust costs based on a patient’s ability to pay. If you need assistance, please inquire at the front desk. Conforme a la política de Wheeler, existe una escala progresiva de cuotas, basado en la capacidad de pagar del paciente. Si necesita ayuda, consulte en recepción. and a deemed Public Health Service employee under 42 U.S.C. 233(g)-(n). Express a complaint or grievance by contacting the Quality Department at 860.793.3500. Please contact The Joint Commission if you are not satisfied with the outcome of your grievance. Copyright © 2011-2019 Wheeler Clinic. All Rights Reserved.